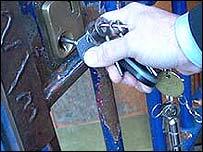 An East Yorkshire jail must make sure that its good education and training is available to all prisoners, a report by the Chief Inspector of Prisons says. Anne Owers said Everthorpe Jail near Brough was one of the best training prisons she had ever inspected and praised staff attitudes. However, there was not enough training for all prisoners, the inspector said. Expanding the jail, which has more than 450 inmates, would probably make this worse in the short term, she added. The jail is set to undergo a redevelopment allowing it to house 40% more inmates. Everthorpe's governor, Amy Rice, said she was confident their training programme could cope with the expansion. David Davis, the MP for Haltemprice and Howden, said: "This report highlights how well Everthorpe is doing in issues relating to safety and training, for which the staff should be congratulated." But Mr Davis said the jail already had too many prisoners and warned against possible over-crowding after its expansion. The latest figures show that the current population of the prison is 464, 27 more than the prison is certified to hold. "Everthorpe, in common with prisons across the country, is facing an overcrowding crisis and the Home Secretary is to blame," he added. "This failure by the Home Office threatens to undermine all the good work detailed in the report and will make improving the areas which are currently underperforming that much more difficult."